The Karnes City Police Department is comprised of highly motivated employees who possess the highest standards of ethics and integrity and it is these qualities which create the foundation of our ability to deliver a variety of effective and essential police services. The department and its employees are committed to reducing crime and the fear of crime, and improving the community’s overall quality of life. This is accomplished by building and maintaining effective partnerships with the community we serve. 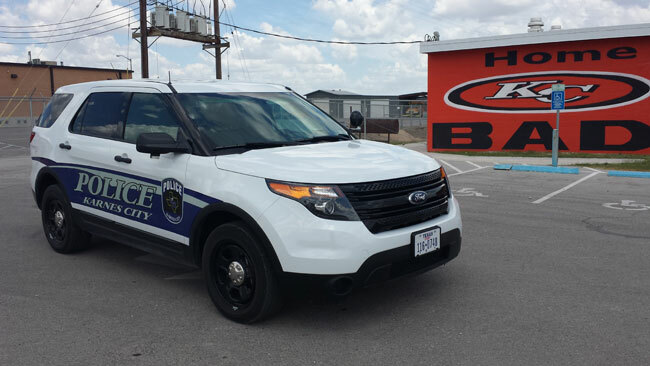 We, the members of the Karnes City Police Department, wish to create a safe environment for our community, with an attitude of fairness, compassion, and respect. In the exercise of our duties, we embrace the highest standards of conduct and ethics. Any person or persons may file a complaint against any employee(s) of the department. Complaints originating from a third party will be documented and submitted to the Chief of Police. Upon careful review, the Chief of Police will make the decision as to whether an investigation will follow. In any case, the third party complaint will be documented and any respective action upon that report will be noted. There are three classifications of complaints: Walk-In, Telephone, and Mail-In. No complaints will be accepted via e-mail. Walk-In or Telephone Complaints made by persons coming to or telephoning the department to file a complaint shall be referred to the immediate supervisor of the employee against whom the complaint is directed. In the event the immediate supervisor is not available the complaint shall be referred to the next supervisor in the chain of command. In the event a supervisor within the employee’s chain of command is not available the complaint shall be referred to any employee of supervisory status, preferably within the same operational component of the employee being complained against. Mail-In Complaints are complaints sent to the department via the mail and shall be forwarded to the Chief of Police. Upon the submission of a complaint, the Chief of Police will review the complaint for indexing, classification, and investigative assignment if necessary. Complainants shall be notified in writing that their complaint has been received and is being investigated. This notification shall contain the complaint control number for reference purposes. A copy of this notification shall become part of the investigation record. Upon completion of the investigation the Chief may orally or by letter notify the complainant of the general findings and conclusion of the investigation. The following contact has been established for any compliments or thanks you may have for an individual police department employee or the department in general. The Karnes City Police Department offers numerous ways to report information to the department. These include inquiries related to open-records, requesting a report as well as making requests for extra patrol. These report options should not be used to report any type of in-progress or public safety issue as they are not monitored on a 24 hour a day basis. Reporting these types of incidents should be through normal means such as 9-1-1 or the police department non-emergency dispatch line at 830-780-3931. Karnes City Police Department participates in the Karnes County Crime Stoppers Program. How does crime stoppers work in Karnes County? Know about a crime? Report it and get CASH for tips. If you ask most anyone if they ever heard of Crime Stoppers, they will invariably say they have because on a fairly, regular basis crime stoppers is mentioned on TV and ads are seen in the newspaper. However, if you ask how crime stoppers works, most people really don’t have a clue. Let’s say you see a crime being committed or you have information concerning a crime that has been committed. You can call the Karnes County Crime Stoppers at (830) 780-4636 (INFO) and give them the information. They will give you a report number. They will not ask your name or anything about you. They will also not have your phone number because the phone is not answered locally. Karnes County Crime Stoppers contracts with a company who takes calls from numerous Crime Stoppers organizations in Texas and the United States. The information is then forwarded to our Crime Stoppers’ Coordinator, who is on call 24-7. The Coordinator then forwards the information to the appropriate law enforcement agencies. Rewards will only be distributed if your tip leads to an arrest. You can check on the status of your reward, if any, by calling Crime Stoppers and giving them the report number you were given. If you are due a reward, you will be given instructions on how to collect it. No questions asked – no ID required. Protect your number because anyone with that number is able to collect the reward. Use the form below to contact an individual – sending the form will send them an email. Use the “Person to Contact” drop-down to choose the individual.